Top tracks: "If the Law Don't Want You," "I'm a Mess," "God, I'm Missing You"
Mary Karr's childhood was a mess—and she's the first to admit it. The poet-essayist's seminal memoir, The Liars' Club, is a harrowing tangle of substance abuse and mental illness, a web of broken hearts and human depravity. It lends new weight to the term "broken home." Even the way the story is told, in non-linear fashion, seems to underscore how fractured those days really were. The same kind of brokenness haunts Kin, a collection of songs based on Karr's memoir. She wrote these pieces with country singer (and fellow memoirist) Rodney Crowell; because Karr herself isn't a singer, Crowell performs the songs with a series of guests, each of them so good it would be a sin to call them stand-ins. Norah Jones, Lucinda Williams, and Emmylou Harris are all here to fill Karr's shoes. Crowell even shares space with Kris Kristofferson and Vince Gill. And Kin, produced by Joe Henry, is a bright testament to the power of song and story to find meaning in brokenness. It's an album fraught with heartache and regret, to be sure—but it's also filled with beauty and grace. 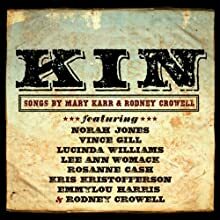 Henry is known for drawing soulful performances from stellar singers, and there are plenty of knockout performances on Kin; Jones, Williams, and Harris are terrific in surprising ways, and Crowell is stalwart as the album's anchor. The songs lean toward country, with plenty of pedal steel, jaunty piano, brushed drums, and fiddle; if the studio musicians are perhaps a shade too genteel, the singers more than compensate, bringing warmth and tenderness even to the saddest songs.